August 2009 was a whirlwind of travel and family visits for us. The three main vacation points were Flat Rock, NC, Wilmington, NC and the Upper Peninsula of Michigan. 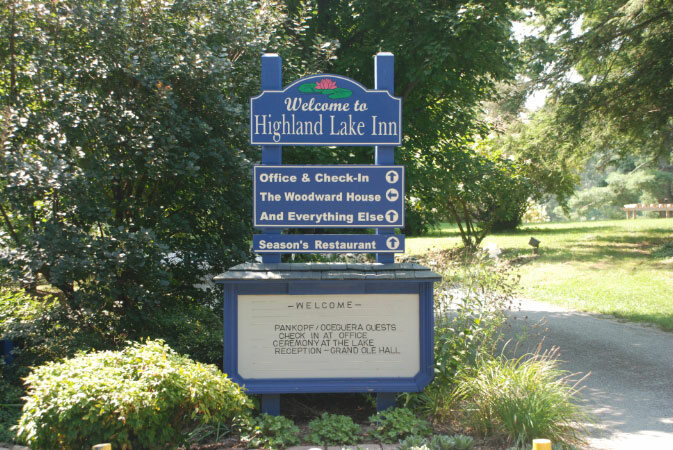 We traveled to Flat Rock, NC for Kate and Cam's wedding at the Highland Lake Inn. Lot's of fun and lots of Pankopfs. All brothers, sisters, nephews, nieces, aunts, uncles and cousins made the trip. We took a leisurely two day drive, stopping in Prestonsburg, KY for a night. The drive was great - we did very little Interstate driving, opting for the two lane routes. We happened to pass Bennett's Mill Bridge in Kentucky - one of the state's longest covered bridges. That sort of surprise doesn't happen much on I-75. Saturday, the big day, C and I took a canoe ride on the lake in the morning. Great photo opportunities for (semi) wildlife and other nature based subjects. Spent the rest of the day visiting, eating and napping on a hammock. The ceremony was nicely done and the party afterward was fantastic. Sunday, we bade farewell to the Pankopf clan and headed for the shore to visit C's father. Our visit began with a trip to the boardwalk where we all tried a Brink's donut then a trip via car ferry to Southport for lunch. Tuesday, which turned out to be the hottest day of the year at 97 degrees, we went on a deep sea fishing trip. We caught Spanish Mackerel which the mate filleted for us. We took the fillets to the restaurant next door and they fried them for us. C's dream of "out of the ocean and onto my plate" came true! Wednesday we visited the Bellamy Mansion and the USS North Carolina battleship. Unfortunately there were no sightings of Charlie, the alligator that lives by the ship. Thursday we took a leisurely stoll along the Cape Fear river. We returned home to the kids - where after nine days by themselves they were very happy to see us. The following Thursday, Julie arrived for a long weekend in the UP. Despite the weather, we had a hectic plan to visit 9 lighthouses and the Tahquamenon Falls. We also managed a Soo locks tour by boat. Lots of great pictures of freighters, lighthouses and general all around scenery.